When I woke up this morning, I realized that I had left the United States three weeks ago today. Sometimes, three weeks feels like a year, but I feel as if I left New Jersey yesterday. I am already almost halfway done with this program, I have done so many great things with so many great people, and I still feel like my time in Israel is flying by. It is crazy to me that it has already been a week since I wrote my last blog post, but looking back on it, so much has happened, including exploring Tel Aviv on my own, traveling to two cities I had never seen, and of course, some delicious meals in between. The week started like any other: I went to work on Sunday and Monday, and then went home to my apartment for the night. Speaking of work, that is going very well and I love YJ and the people who work here more and more everyday. The work is very interesting, ranging from writing these weekly blogs (hey!) to helping with the management of the Twitter and Facebook pages to interviewing participants on various YJ programs. I always feel interested and engaged, and I could not have asked for much more. On Tuesday, our weekly group trip was to Hebron in the West Bank. As if the fact that we traveled to our destination in a bulletproof bus was not apprehension-building enough, there are more soldiers in Hebron than there are civilians. After being assured and reassured that Hebron is a safe city, I still was not buying it. It was one of those situations that you had to see to believe, and it ended up being a really cool place; I did not feel unsafe for a single second there and I am glad that I got to see it. We started the day with a tour of the Cave of the Patriarchs, then went on to listen to a speaker about the Arab-Israeli conflict who gave us more insight on the situations in both Gaza and the West Bank. On Wednesday, I realized that I had not been to Tel Aviv since Shabbat, so I decided to take a little adventure after work. I got off on Allenby Street near Shuk HaCarmel, which is a very central location of Tel Aviv (if you ask me, at least… Someone else may shake their head at this). To me, an adventure is defined by ditching Google Maps and exploring without the iPhone glued to your face (to those who know me: please stop gasping and take a deep breath after that statement). I saw the street sign for Sheinkin Street, which I had been meaning to check out. Some people had described it as the “SoHo of Tel Aviv,” which is a bit of a strech, but it was still very up my alley. I stopped by at a candy pharmacy, which had syringes and pill bottles full of chocolate and various types of candy. No purchases were made, but an Instagram was taken. I do not think the lady who was working was very happy with me, but YOLO am I right??? I continued to walk, and somehow ended up at Dizengoff Center, which is a huge mall. Shockingly enough, I went in and shopped around. Though it was 17:00 (this is my attempt to immerse into Israeli culture, in addition to trying to use WhatsApp instead of iMessage) and my group had a Shakshuka Night planned at 19:00, I remembered that a dessert place on my Tel Aviv restaurant bucket list called Cookeez was on Dizengoff as well. Cookeez is Israel’s version of Insomnia Cookies, and if you ask me, it puts Insomnia to shame. A delicious chipwich was eaten and no regrets were had. Then I came back to Bat Yam and had delicious homemade shakshuka, a classic Israeli dish made of tomato sauce and sunny side up eggs, with the Northern New Jersey delegation two hours later, because life is short and dessert before dinner is beseder, tov, sababa, yoffi, and nachon, which all happen to be Hebrew synonyms for “ok” and “good.” I have not decided which to adopt yet, since sababa sounds coolest, but tov is one syllable. Decisions, decisions. Thursday night was a celebration called Laila Levan, or White Night. Laila Levan is an all night festival that takes place all over Tel Aviv, and people of all ages are roaming the streets and having a fantastic time all through the night. 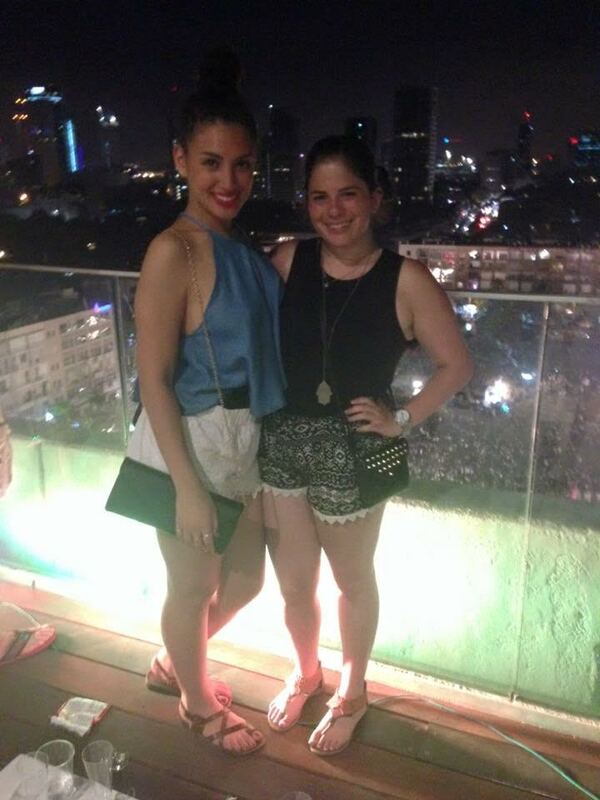 Though my roommates Alyssa and Sara and I only lasted until about 4:30, we were joined by Alyssa’s friend from home on another program, her older brother who made Aliyah, his boyfriend, and his friend, and our little group had an amazing night full of laughs, dancing in the streets, going to the roof of Kikar Rabin (city hall), and you guessed it…EATING! The highlight of the night was the rooftop of Kikar Rabin: the views were amazing, and it was not open to the public so I felt really cool being able to get in. The night ended with a 3:30 AM trip to Benedict, a restaurant that specializes in… Are you ready for this… Eggs benedict. It had been on my bucket list, and though I expected to try it at 10:00 AM, there is never a wrong time for brunch. Plus, it is cheaper after midnight, and was delicious! On Friday, Alyssa invited me to stay with her family in Netanya, a beautiful city a little bit north of Tel Aviv, for Shabbat. We stayed in a beautiful penthouse right on the beach and her family could not have been more nice and accommodating. It was an incredibly relaxing 36 hours, as we stayed until Sunday morning, full of rainhead showers, being beach and Jacuzzi bums, and the most comfortable bed in the world. We had a great time together, and I am so thankful for all of the great hospitality her family provided! That’s all I really have for today, but I am lehitragesh, or excited, to tell you about this upcoming week!